Displays information about the battery and its health, and provides a test of the charging socket. The information includes the status, battery level, health, and temperature. Key information is color-coded with green indicating “OK”, red “NOK” and orange a ‘warning’. If the battery health is good, this will be shown as OK (in green). If the battery health is cold, dead, overheating, overvoltage or some other unspecified failure, the health is shown as NOK (in red). Unknown battery health is shown in orange. Note: battery discharge is tested in the last test (Stress Test). The charge socket is tested by inserting a charging cable. When a USB or AC charging cable is inserted and the device starts charging, the charging socket status will change to “OK”. This tests the USB power connections. The battery health is either good, overheating, overvoltage, cold, a failure value, or dead. “Good” is the desired health. This means that no problem has been identified with the battery (specifically, the battery subsystem has not triggered a condition that it determines to be a fault). 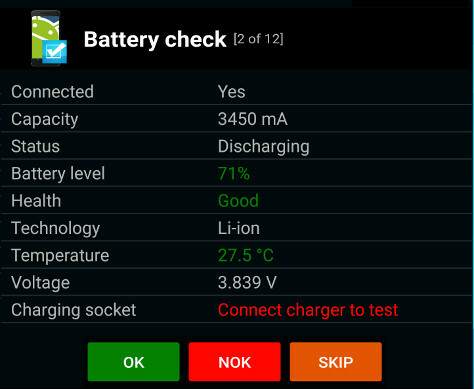 Based on the battery information, select OK or NOK to complete the battery check. If your device is not charging then the first step is to determine if the problem is with the phone, cable or charger. Try a different cable to see if it is a faulty cable. Then try a different charger to see if it is the charger. Check the case is not interfering with the connection. If the problem is none of these, then visually inspect the phones USB connector (as these can be damaged) – if there is physical damage, wear or loose fitting, then you may need to consider repair (or a new phone). If your device is charging slowly, then you should also follow the suggestions above. In addition, a phone will charge faster if it is turned off or at least has the display turned off (in sleep mode) as it will consume less power while charging. Charging from a wall outlet is typically faster than from a USB port on a computer as AC adapters can provide a higher charge. If your phone supports fast charging, for example, the Samsung Galaxy S7, S8, and S9 support Adaptive Fast Charging, then to get the benefit from this, you need an Adaptive Fast Charging adapter (this can charge at higher voltages – which may be quicker), you need the supplied cable (as the cables may have a thicker gauge); you also need to enable this option in Settings → Battery, Advanced, Enable Fast cable charging. The Stress Test (the last test in the guided series) forms part of the overall battery test. It is recommended that this test is allowed to complete (i.e. don’t press ‘skip’), is run while on battery power and is not in a battery saver mode. This test checks the battery discharge rate while under a known load. If your device is discharging quickly, the first thing to check is what is using the battery, see, Settings → Battery, Battery usage. Focus on trying to reduce the highest battery use item. Typically the Screen uses the most power (you can reduce the brightness setting), but background tasks (e.g. Cell standby can use a lot of power in areas with poor cellular coverage) and apps can consume a lot of power and run the battery flat quickly. Finally, if none of this helps, it may be time to talk to a repairer about whether you need to replace your battery. Note 1: Battery temperature is deemed to be too high when above 40C. High temperatures are not good for your battery, make sure you don’t leave your phone in a hot place for long periods of time (like in your car all day or on top of hot electronic equipment). Also, beware of quick chargers as these can generate extra heat. Note 2: Some devices report the incorrect battery capacity. The app filters out capacity values that appear incorrect. If a capacity value is not shown, then it has been deemed as possibly not accurate.